My wife was out tonight, so I thought I'd make some easy comfort food that my daughter would love. Yesterday was Vegan Pizza Day but we didn't eat at home (we went out to see a Indigo Girls concert), so I thought I'd pick up a favorite frozen pizza shell, Vicolo Pizza's organic cornmeal (thick crust). 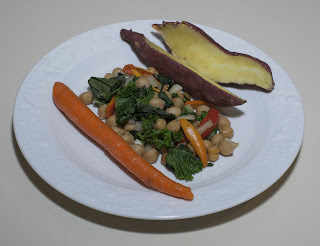 My daughter, four and a half years old, helped make this simple but tasty and filling meal. I sauteed (without oil, though this was not a no added fat meal) a little onion, red bell pepper, and Field Roast vegan apple-sage sausage, and topped the crust. 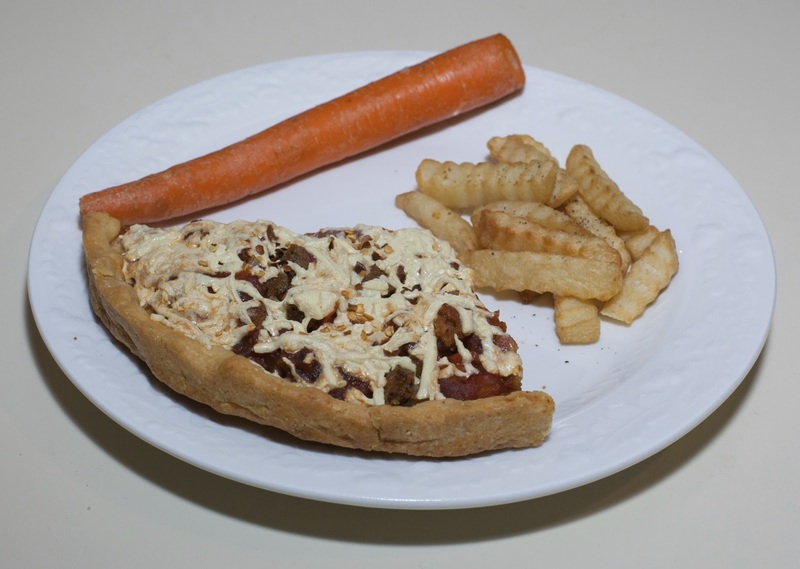 My daughter spread sauce and Daiya vegan "cheese", and we baked the pizza plus some crinkle-cut French Fries. Yummy! 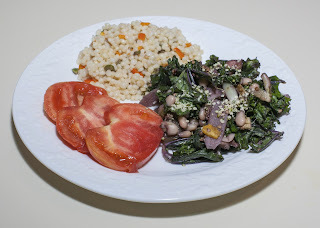 I served this with a baked potato and with tomato slices topped with hemp seeds. I loved the dish - what a good combination. 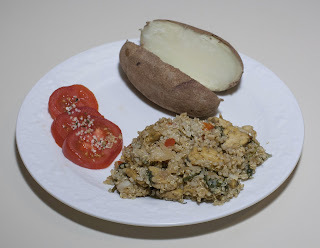 My wife thought that it was good but could use something like a little bit of sauce, but, to my palate, the curry flavors work well as I prepared the dish here. My four-year-old daughter liked the dish but added ketchup! 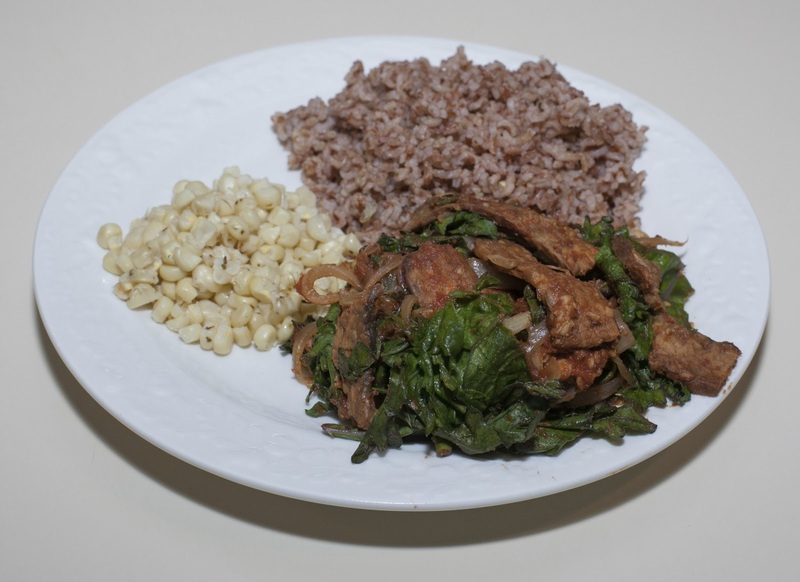 I'd love to make more tempeh dishes mixed with grains. 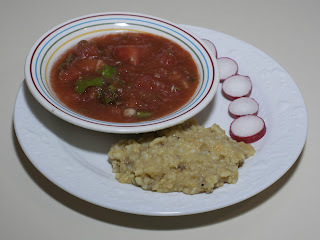 We loved the watermelon gazpacho that I put together on Father's Day recently, and I made a variant of it today, including 1/4" chunks of half of an avocado and with other changes, such as not including vinegar. I also made a polenta - seitan - baby artichoke saute since I found baby artichokes on sale. I prepared the artichokes as I explained back in May 2006 but, this time, used my Saladmaster stainless steel-titanium pan with no added fat. Dinner was good! I found baby artichokes at a local supermarket a few days ago, and bought a dozen or so. I prepared them as I described in June 2006 by bringing to a boil a pan of water with a vegan bouilon cube and some fresh lemon sage (normally, one should not boil or overly cook herbs, but it works well in creating a broth), then "by pulling off the outer leaves till I got to tighter and lighter colored ones, then I cut the top third or so off as well as the bottom, and quartered the heart. I put the quarters immediately into a bowl with a little lime juice to slow down browning. When the quarters were all ready, I put them into the simmering broth, cut side down (though I later thought maybe the thicker side needing more cooking may better be cooked face down - maybe I'll try that next time). There was enough broth in my pan to not quite cover the hearts. I reduced the heat and simmered, covered, for about 20 minutes till the hearts were tender." This time, I used ample broth that more than just covered the artichokes. I had on hand one of those packages of delicious Upton's Naturals Italian seitan that I described a few days ago. 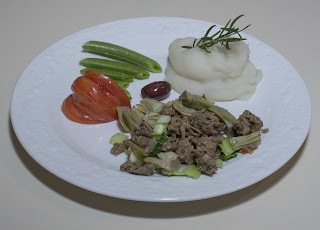 Once the artichoke was ready, I drained the pan, reserving a little liquid to use in making mashed potatoes, and crumbled in about 3/4 of the packet of seitan into the drained pan. I added a small baby bok choy cut into approximately 3/4" cubes, a little more fresh lemon sage, and a little freshly ground black pepper and a pinch or two of salt. I served with mashed potatoes, heirloom tomato, and peas. It was all good! I describe this as a no added fat meal, in spite of having one olive added mainly for aesthetics, and the seitan. A medium olive has about a half gram of fat. The whole packet of seitan has about 12g of fat and each of our four servings of 3/4 of the packet had about 2g of fat. No oil was used for cooking. I was planning on getting the grill out and enjoying making some food on the deck, but we had a strong downpour of rain this evening. I recently picked up a new product, Qrunch quinoa-based burgers (soy- and wheat- free), and am anxious to try them. My daughter has a friend visiting down the street, and I had hoped that that girl and her grandparents might come for dinner tonight or tomorrow, but it seems that may not happen. In preparation, I had picked up good vegan buns (for some reason, many buns appear not to be vegan, whether because they contain strange-sounding ingredients that may be animal derived or because they explicitly state that they have dairy or egg products in them) from Weaver Street Market. So that they don't spoil, I wanted to use some today and perhaps the rest maybe just for my own family when we try the quinoa burgers soon. 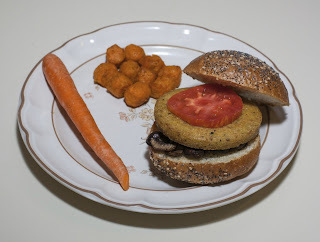 So, my constraints were to prepare a meal with buns, but not use the quinoa burgers in hopes that better weather is coming and perhaps our friends will join us. I decided to use just a little bit of oil in my cast iron pan to brown and cook two vegan apple-sage sausages, onion, and zucchini. I served that on the warmed bun. I also boiled some halved locally grown fingerling potatoes and served that with some herbs. Dinner was good! By the way, I made a tasty "ice cream" (really, sorbet) after dinner. I put in my Vitamix blender maybe 2 cups of organic frozen strawberries that we had recently picked, juice of one lime, a few tablespoons of maple syrup, about a dozen mint leaves, and an eighth of a lemon, seeded but otherwise inclusive of skin and all. It comes out so tart, creamy, and delicious! I don't typically gravitate toward cold summer gazpacho soups, but my wife likes them and we both loved the gazpacho we had some years ago at a French restaurant in Key West, Cafe Solé. 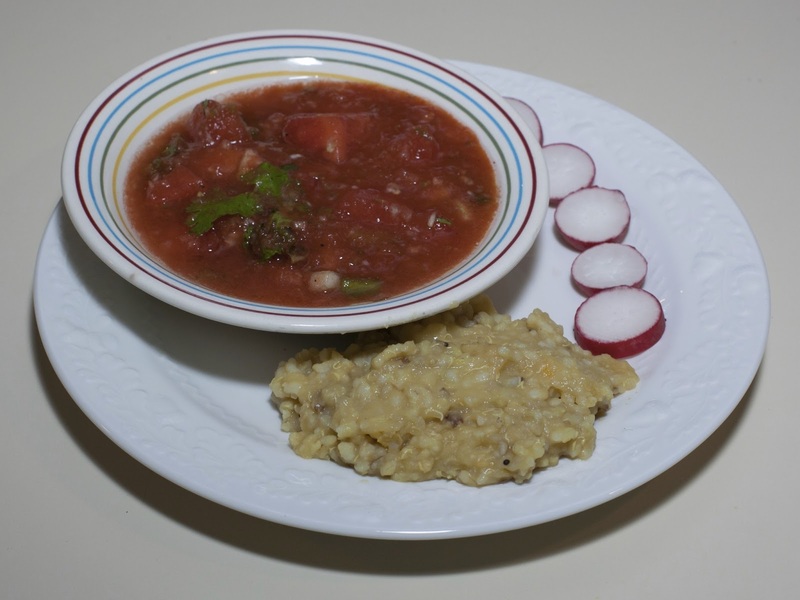 I had cut a watermelon today and thought of using part of it as a base for just such a soup; I found a recipe for Watermelon Gazpacho online that sounded good, and used that as a base to help me formulate my own recipe. The recipe that I found called for finely dicing 8 cups of watermelon, finely dicing a seeded and peeled cucumber, finely dicing half of a bell pepper, chopping a quarter cup each of basil and parsley, and mixing this all in a bowl with 3T vinegar, 2T minced shallot, 2T oil, and 3/4 t salt. Most of the mixture is pureed then all is mixed again and served cold or at room temperature. I liked this idea, but didn't want to use oil (and don't see the purpose, really). My family is not a fan of vinegar, and I should have left it out, but I did use about half as much as the recipe called for. I also wanted a chunkier soup. Here is what I did. Add the watermelon to a large bowl. Peel the cucumber, remove and compost or discard about an inch from both ends, and cut in half lengthwise. The seeds can now be easily scooped out - I actually like them and enjoy them as a snack while I'm cooking and they can be left in, but try removing the seeds. Cut the cucumber into small pieces maybe 1/4" wide x 1/2" long, and add to the bowl. Add the onion, bell pepper, and tomato sauce to the bowl and mix. Transfer about 60% of the ingredients to a blender. Add to the blender the lime or lemon juice and, if being used, vinegar and/or jalapeno pepper. Blend on low or medium briefly, aiming for a slurry that is mostly liquid but with definite chunks of size perhaps 1/8" or so. Mix the blended ingredients into the bowl with the other 40% of the ingredients, then hand mix in herbs, salt, and black pepper. 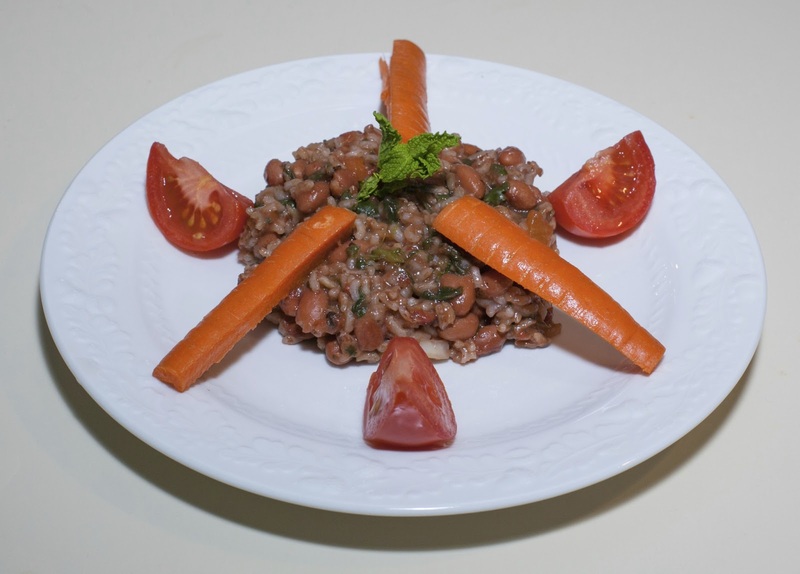 Serve with optional parsley or cilantro sprinkled on top; it is good either chilled or at a cool room temperature. Wow, this was good! Not only did my wife and I love it, but my daughter asked for it the next day and even my Dad, who can't chew and usually may not try something so "different", liked it. It's a winner and I think will likely be something that I make periodically in the summer. 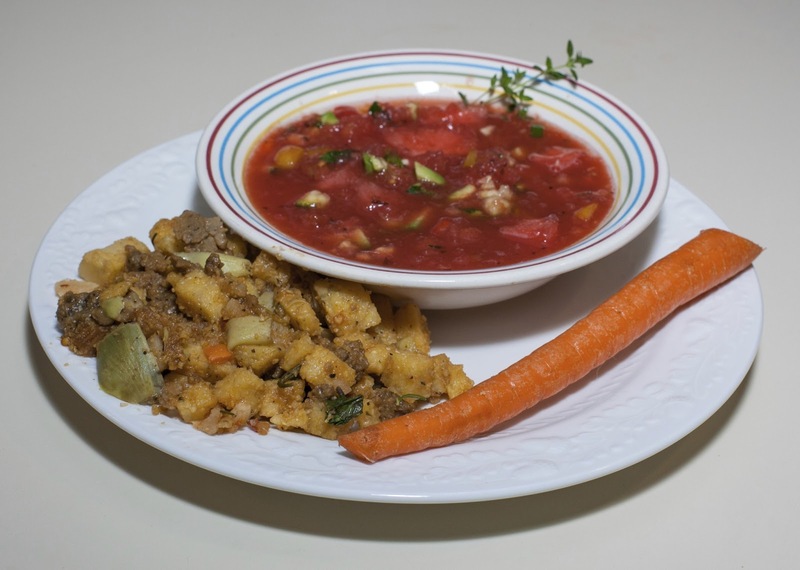 It's easy, tasty, and nutritious with a lot of lycopene and fiber! I served the soup with some leftover kichidi (rice and lentil porridge) that my wife had made earlier in the day, as well as with some radish. Because our family doesn't like vinegar, I'll make this next time without. I think that a little celery, cut into 1/4" or 1/8" cubes, would be a nice addition, as well as celery seed (I used to use this all the time right out of college, but in recent years seem to have forgotten about it!). My Dad doesn't eat garlic, but some coarsely chopped (maybe to 1/8" cubes) garlic would have been good in the initial mix in step 3. I made a simple dinner that came out pretty well. I don't much like red beets; they stain and sometimes bother my digestion. But I do like golden beets, particularly baby goldens. We didn't have baby goldens, but did have regular golden beets. I had the challenge of cooking with a preschooler taking a late nap and about to get up, but insisting on getting a little bit more of a nap on my shoulder while my wife was taking a sitar lesson. I carefully, one-handedly, cut three beet roots from the greens and cut the roots into quarters, then added them to boiling water. When the beets were done (I think these took about 40m till they were reasonably soft), I took them out of the water and replaced them with the greens, which I parboiled for just 2 minutes or so, letting the greens darken in color. I made a bed of the greens, mixed in a little salt and tarragon, then topped with beets, shallots, and refried black beans. 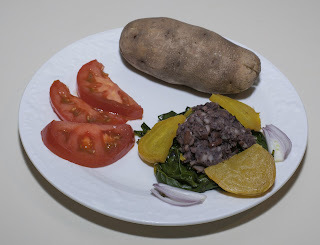 A baked potato (plain to complete this as a no added fat meal) and tomato completed the meal. We were lucky because we had two very nice visitors this evening. One of our friends was going out for the evening and asked if we would keep her sweet daughter, almost 2 years old. Another friend had her granddaughter, a year older than my daughter and, along with the younger child, friends with my daughter. I wanted to get the two "older" girls to help me to make organic blueberry crisp and, while it was baking and cooling a bit, make a quick and appealing (to them) dinner. (The crisp came out great, by the way - they did a very nice job!) My daughter (like, it seems, most children) loves macaroni and cheese. I like Road's End Organics macaroni and "chreese", and had a box on hand. However, my wife doesn't like cheese (vegan or not). So, my constraints were to make something soft for my Dad, make the macaroni and "chreese" for the girls and me, make something that my wife would enjoy, and do it all quickly. 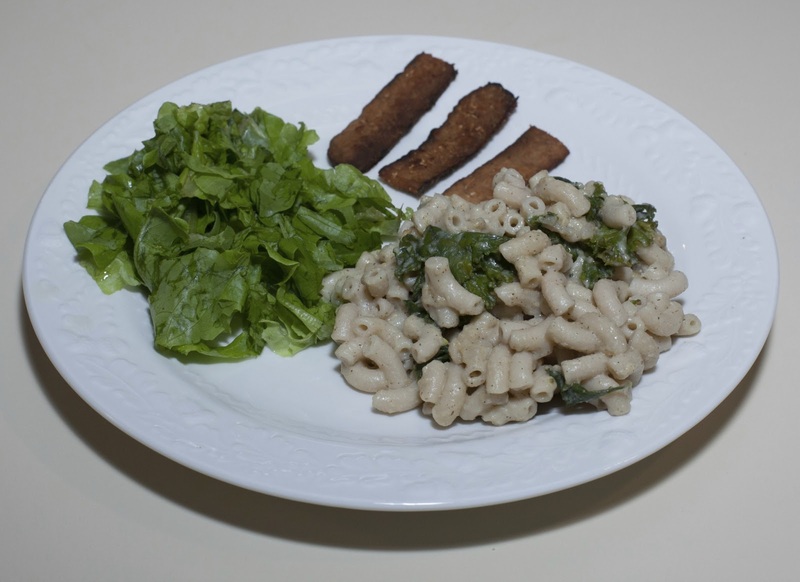 I think that I succeeded; I made the macaroni with kale and shallot, as well as hemp seeds; before adding "chreese", I served my wife. I also grilled some smoky tempeh. We are low on salad ingredients, but the younger girl's Mom brought some home-grown lettuce, which I served, as well. I made a simple soup, a second soup of refried beans cooked with water, and a nutritional shake (tasty and truly nutritious with lots of good ingredients) for my Dad. Though this used processed ingredients, the macaroni and "chreese" has only 4g of fat in the entire box - even with added homemade almond milk (about a half cup -- maybe 2 more grams of fat), there is minimal added fat, so I am listing this as a no added fat meal. I didn't use any oil even in grilling the tempeh. Everybody was happy with dinner - especially the girls! I bought some okra today and was anxious to make something hilighting it, without hiding it amongst too many other ingredients. Here is what I did. I put the onion into my stainless steel-titanium Saladmaster saute pan then began cooking, stirring occasionally, over medium heat. After about two minutes with the onion not yet turning clear, I added the okra, cut side down, and continued stirring occasionally. I cooked for another 4 or 5 minutes; the onion was now partially carmelized and the okra was showing a little bit of browning. 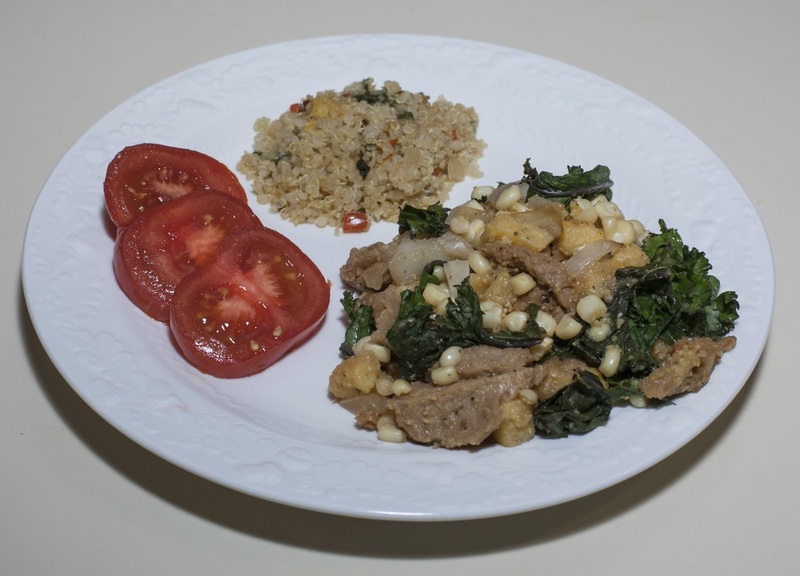 I added the kale and corn, stirred and cooked for a minute and a half or so, then added the sauce, which I made by putting all of the sauce ingredients in my Vitamix blender and blending on low then ramping up to high till liquified (a total of maybe 7-10 seconds). There was no added fat and the little bit of browning of the pan was quickly removed as the sauce cooked in it. I cooked for a minute and a half or so, then added tarragon and salt. When I served, I sprinkled hemp seeds atop the vegetable, and served with a baked Japanese sweet potato and tomato. The dish was good! 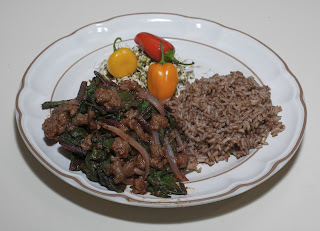 I resisted stronger sauces, such as tomato-based ones, because I really wanted the okra to come out. My Dad, who hasn't been able to chew, has been visiting, so I was simultaneously making a brown lentil dhal with several vegetables and really cooking it in a lot of water so it would be quite soft; I had the temptation to put a little bit of the dhal in, but decided in favor of making the miso sauce. The purple-skinned but off-white fleshed Japanese sweet potato has become over the past year or so my favorite sweet potato. 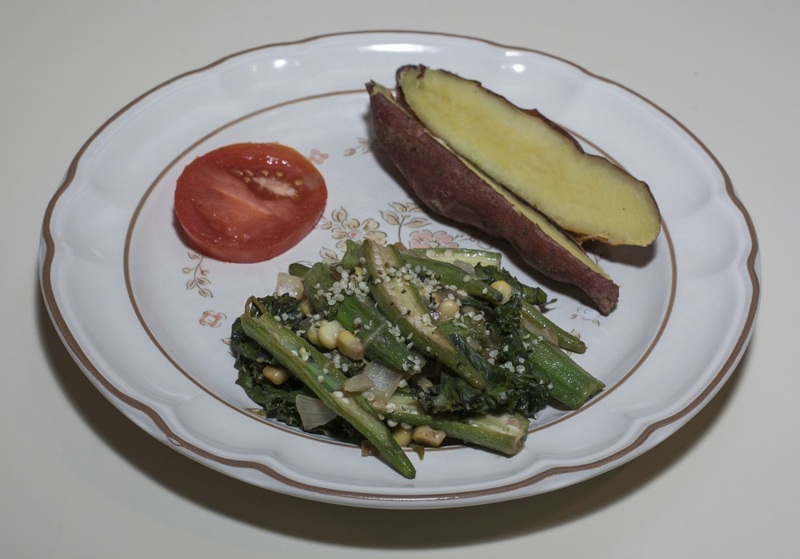 I have found a supply of small and thin Japanese sweet potatoes, which I seek for reduced cooking time (I think these were done in my toaster oven set to 375°F in just a half hour or so, though I cooked them for longer so that my Dad could enjoy them, too). I wish that I had more salad ingredients on hand, and a thick slice of tomato sufficed for the "salad". Obviously, this could have been enhanced with a more substantial salad. I think of more fiery spices when I think of okra, such as in gumbos or Indian dishes. However, I have to have my preschooler's needs in mind, especially since she loves okra. Were I to make this just for my wife and me, I'd add some heat, perhaps chile powder or jerk seasoning. The plate looked a little empty, but a real salad would have filled it in nicely. I shop only once in a while at Earth Fare and found myself there today. Seitan is one of my favorite foods; I normally use Westsoy seitan strips (they used to be made by White Wave) but at Earth Fare found a brand new to me, Upton's Naturals. They had traditional and Italian seitan varieties. I bought their Italian seitan and, wow, it is now my favorite seitan that I've had! I've made seitan from scratch. Recipes are easily available (this one looks good and my friend Eleni has made a video about the process) but when I have made my seitan from wheat gluten, others have liked it, but I found that I preferred what I can find in the store. Maybe I should try again - especially since one of my signature dishes is my lime jerk seitan. Anyway, the Italian seitan tastes great! My wife, preschooler, and I all loved it. It comes out of the package as a crumble, and the Italian seasonings are not obvious ones I would have chosen with seitan, but taste great. 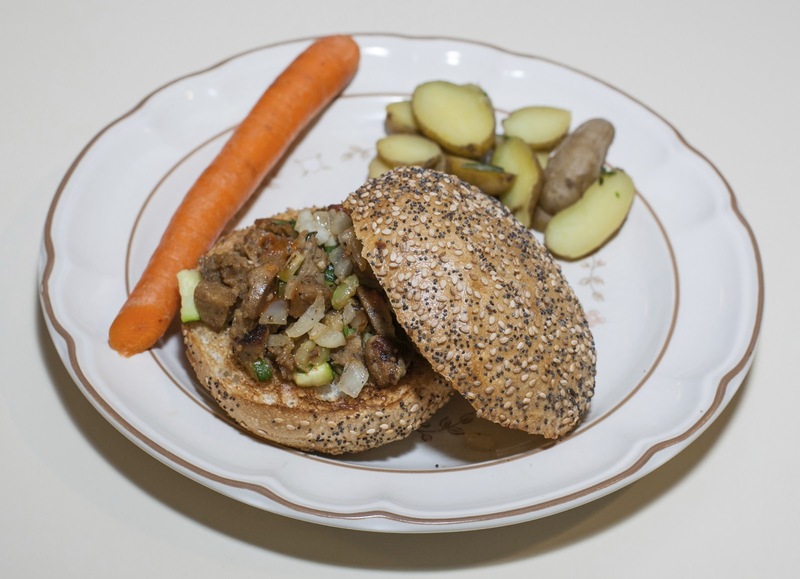 The company sounds great; they are in Chicago, all vegan, and specialize in seitan. They are planning on opening a vegan cafe in Chicago this summer! The Italian seitan comes in an 8 ounce package and consists of vital wheat gluten, whole wheat flour, water, garlic, oregano, sea salt, onion, fennel, black pepper, red pepper, and soy sauce (I wonder if they have considered using coconut aminos to make it soy-free and to greatly reduce the sodium). If one were to eat a large serving of a half package (double of what they report is a single serving), that would come to 3g of fat, 30g of protein, 200 calories, and a not insignificant 528mg of sodium. In comparison, the West Soy seitan comes also in an 8 ounce package (but lacks the interesting retro plain cardboard appearance) and is comparably priced (at about $4). A large four once serving would be about 2.5g of fat, 26g of protein, 150 calories, and 400mg of sodium. Maybe its the novelty, but we all loved the "new" Chicago seitan. I am excited to see the range of products on their website, including several more kinds of seitan, tamales, wraps, and more. I will have to ask Upton's Naturals to participate in our annual Thanksgiving raffle! So, getting back to dinner tonight, here is what I did. I used my stainless steel-titanium Saladmaster saute pan; before heating, I added the onion then turned the heat on to medium. I stirred periodically for about a minute or two till the onion was just starting to get clear, then I added the seitan and beet stems and continued periodically stirring. After about 3 or 4 minutes with the onion starting to carmelize and the seitan just starting to show some browning, I added the greens. I continued periodically stirring for maybe 2 more minutes till the greens cooked down a little, then added the tomato sauce and continued cooking for another 2 or 3 minutes, allowing the greens to cook down a little bit more. I mixed in the oregano and salt, and served with rice (1 : 1 3/4 or 1 : 1 2/3 ratio of rice to water with a bouillon cube thrown in, simmered for about 20m) and salad. We loved the dish and found the seitan to be the best that we've had! The rice is always good - it's pretty, has a variety of colors (think phytochemicals) ranging from rust to pink to off-white, and is a whole-grain rice that takes only 20m to cook. Our salad was homemade sprouts with baby bell peppers. Nowadays, I rarely add fat - this was another dish that tastes great and is filling, but has no added fat. I'd like to routinely get Upton's seitans! I hope that they prove easy to find over time. Though I now rarely use oil, I do find that a little oil can be helpful in crisping tempeh and seitan - but the crumbled and spiced tempeh had its own firm texture that obviated any thought of crisping it. The greens were good, but kale greens would be better.